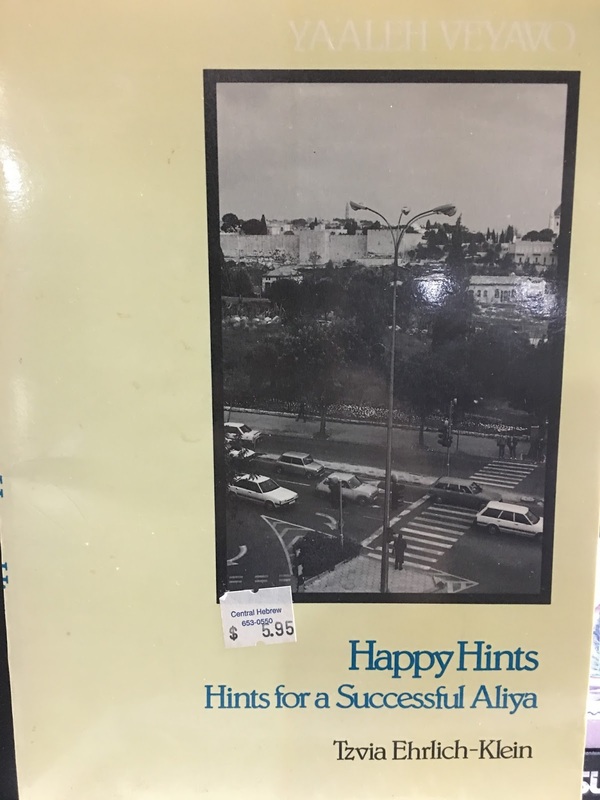 In 1991, Tzvia Ehrlich-Klein published this little guidebook to help people make the transition to everyday living in Israel. 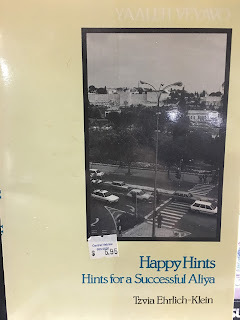 It was full of useful information. When she published her guidebook, most olim from America lived in a mercaz klita (absorption center) when they first arrived in Israel. 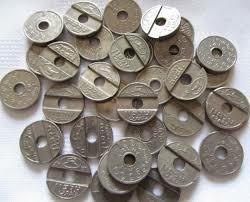 Phone calls were made on public phones using asimonim (telephone tokens). We're talking a decade before Nefesh b'Nefesh was even founded. I'm working on an updated guidebook, chock full of helpful hints for today's olim. Because as soon as olim arrive in Israel, we have to learn tons of new things. Sometimes, a neighbor will give us a useful tip. Other times, we have to learn the hard way. My goal is reduce the amount of trial and error by equipping olim with practical, useful information. I knew that the Hebrew word for spinach is תרד- tered. 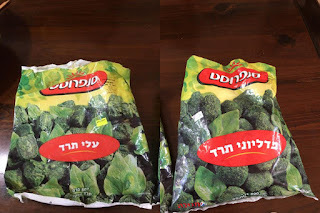 But it took me years to figure out that there are (at least) two different kinds of frozen spinach sold in Israel. I definitely noticed that the frozen spinach pellets I was using came in two sizes. I just thought it had to do with differences in the factory that produced them. 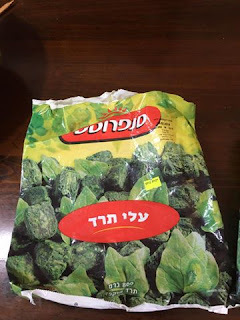 Turns out, the larger pellets are called עלי תרד (spinach leaves) and are frozen spinach leaves. They take longer to defrost and always end up wrapped around the blade of my immersion blender. 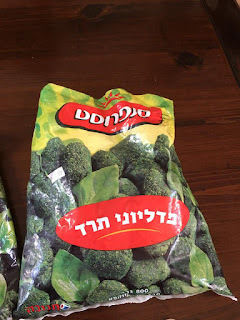 The smaller pellets are called מדליוני תרד (spinach medallions) and are minced or chopped spinach. I think you can see why I got confused. I just looked for the word תרד. Unless you see them side-by-side, the bags are virtually identical. While we're on the subject, notice the red oval at the top of the bags pictured above. That's the Sunfrost logo. They are the most widely available brand in Israel. Sunfrost offers lots of varieties of frozen vegetables, beans and rice and the quality is very good. They also tend to be more expensive than other brands. Now that I've shared my spinach tip, I want to hear from you. I know that if you've been living in Israel for more than an hour, you've got at least one. So, what have you figured out about life in Israel that you'd like to pass on to new olim? Or what small mistake did you make that you'd like to warn others about? Feel free to respond in the comments below, or email TipsForOlim@gmail.com. That's also the email address to use if you'd like to be updated when the guidebook is ready for purchase. ¹ The reason spinach is so awesome in green smoothies is because you can't really taste it. All those nutrients and, despite its reputation, there is absolutely no bitter taste. Spinach for the win! This is important info because spinach must be checked for bugs UNLESS it is chopped. I had no idea that the frozen spinach I use, if not marked "medallions" is not chopped. It's a serious issue for a religious household! Oh, this is an exciting project, Rivkah! Good on ya! I also learned a nice fact about Sunfrost: they go to a lot of trouble to come up with scientific means of ridding things like broccoli of bugs. Very innovative, cutting-edge stuff. Off the top of my head, I will share a mistake I made in language. I was telling an Israeli friend that we were off to the zoo with our kids and grandkids. But the term that came to mind was not "gan hachayot" which means " the zoo" (literally "the animal garden") but "beit hachayim," which means "cemetery." No wonder he looked confused. I seemed altogether too happy to be off for a picnic in a graveyard. 1. You may want to include a section on things which are packaged differently here, making them harder to find at first. For example, baking soda in the US is generally in a box (think Arm & Hammer). Here's it's generally in small plastic packets, so if you're looking up and down the baking aisle looking for the box, you may never find it. 2. Language: If it's Monday and you're making an appointment, and the scheduler on the phone says that the appointment is on "Yom Hachamishi Habah," this does NOT mean that you're appointment is this Thursday. It means that it's a week from Thursday. If you want to say "this coming Thursday", you say "Yom Hachamishi Hakarov". "Habah" in this context refers to the one after this one. I'll be a lot of us have shown up a week early due to this one!